Nicholas Hasluck launching the 2015 Perth Poetry Festival. Photograph by Coral Carter. Friends and fellow poets. Let me begin by saluting the organisers of the Poetry Festival. It is a pleasure to be here. I trust that things will run smoothly for all concerned in coming days. In the course of this Festival there will probably be various encounters with new forms and experimental verse. That is both inevitable and desirable. Poets should always be open to what is new – the turbulent rhythms of contemporary times. But underlying it all one is bound to hear an echo of timeless themes and some responses to a crucial question: what does it mean to be a poet? In looking for an answer to that question I will rely principally upon some lines of verse in the hope that you may hear a few lines you haven’t heard before. For that is why one comes to a festival of this kind. While through the bitter ocean trough it glides. Like useless oars trail limply, clumsy and crude. Is awkward then and ugly and a cause of fun. His pipe into its beak, teasing the crippled one. His widespread wings themselves are his impediment. These lines suggest that the poet is not only an aerial voyager but fated simultaneously to be an exiled or somewhat fraught outsider. With that sense of duality in mind Baudelaire went on to suggest elsewhere that a poet of the modern age should be able to recapture moments in his past at will, resorting to the palette of his youth not as a dilettante fumbling for a dash of colour, but as an artist striving to illuminate the here and now. Such a one will see that the revelations of his own experience resemble the misadventures of his fellows. After dark, as the poet wanders the streets of his city, incognito, observing everything – the crowded cafes and glimmering boulevards, the radiant windows and shadowy stairwells, the theatre queues, the barrow boys, the buskers, the organ-grinder at the pavement’s edge – by an act of the imagination he can magnify an aspect of himself or be another. Like a drifting soul in search of a body, the poet, whenever he chooses, enters the lives and characters of those around him. But the poet is not content simply to reproduce what he sees and hears. The poet is always looking deeper, searching for the essential truth. He must give appearances a new and enduring energy. The voice of the aerial voyager should come to us like a wind along the rooftops, a phantom singing on its own, conjuring up an unfamiliar city, a realm encompassing the insights of the mystic and the vagabond, but composed intrinsically of what goes on in the archaic tenements of the world spread out below. In those lines the poet is seen yet again as a special kind of outsider. The audience for the work of such a one is bound to be small, so fear not in coming days if you are reading to less than a handful. But keep in mind also that the outsider can move inwards and be heard eventually by a multitude. Let me tell you this story. About 20 years ago, as an aspiring Australian writer, I received a fellowship to attend a writer’s colony situated near Saratoga Springs in upstate New York. The old mansion and surrounding bungalows known as Yaddo were established by American philanthropists over a century ago, as a sanctuary for writers and poets to press ahead with their work. Soon after I arrived I met a young poet called Elizabeth. From time to time, readings from works in progress were held in the sitting room of the old, almost gothic mansion at Yaddo. I can recall Elizabeth reading some poems at a gathering of that kind. It was a friendly occasion but as there were only a handful of people in the room, I was soon reminded of similar readings in Australia – tiny gatherings where poets presented their wares to a small but dedicated coterie. About ten years later I chanced upon my poet friend Elizabeth at the Calabash Literary Festival in Jamaica. I was there for the judging of the Commonwealth Writers Prize; Elizabeth was among the poets on the programme. We spoke of our time at Yaddo and swapped news about other writers who had been there with us. I have a photograph of Elizabeth reading at a microphone in an opensided marquee at Treasure Beach, Jamaica, with a glimpse of palm trees and turquoise sea in the background. I can well remember the smell of jerk chicken in the air and the throb of marimba drums from Jake’s Hut nearby where most of the visiting writers were staying. The audience for Elizabeth’s reading was larger than at Yaddo, but still not very large. I next saw Elizabeth a few years later. It was about 3 am on a Wednesday morning. I was in pyjamas at the time. From my home in Perth, like many others, I had tuned in to see the newly-elected President of the United States, Barak Obama, take the oath of office. After he had spoken, a reading was given by Elizabeth Alexander, Professor of African American Studies at Yale University. Elizabeth, the littleknown poet I had seen reading in an almostdeserted sitting room at Yaddo, then in a tent near Jake’s Hut in Jamaica, was now standing on a stage outside the Capitol building in Washington DC. She was reading her work to a worldwide television audience of countless millions. She and her fellow poets on that day turned inevitably to the themes that have always been of interest to a general audience – birth and death, love and passion, and a preoccupation with the past, for when we love life, we love the past, because the past is that much of the present which has survived in human memory. In Elizabeth’s case the outsider had moved inwards and momentarily come close enough to the centre of things to be influential, to mark the beginning of a new era, to shape the tone of times to come. But the duality in a poet’s nature and the timeless themes I mentioned a moment ago are always there, and they can have the opposite effect. As the end approaches, a poet who has been close to the centre of things may finish up on the margins, in a kind of exile, as yet again he or she dwells upon the past and a love of life. This brings me to the work of a contemporary Australian poet who worked in every corner of the literary world and found his way eventually to the centre of things – Clive James. Tonight is a fitting occasion to honour a great Australian writer who is now, by his own admission, very close to the end after a long and debilitating illness. Some years later, by then a leading TV critic and prominent figure on the London literary scene, Clive James went on to write some memorable satires in rhyming couplets These included his portrait of Margaret Thatcher at a Conservative Party conference, described in these lines as Margot Hatbox. To give her kit of axioms an airing. a schoolgirl twice as grown up as the boys. Emerged abruptly from the massed loudspeakers. Of freedom. I am too. Oh gracious yes. The idle that the world owes them a living. The welfare system needs to be re-modelled. But now, in recent years, having been right at the centre of things – critic, novelist, TV personality – Clive James has come back to poetry. The elegiac works in his recent book Sentenced to Life are particularly memorable as he reflects upon mortality and – to paraphrase T.S.Eliot – dwells upon things ill-done and done to others harm which once one took for exercise of virtue. Were just dreams, even when the dream came true? Of breakdown: the false freedom of excess. Where few will look at me with shining eyes. Out of the looking glass was seeing things. And by the harsh awakening it brings. I came home and was taken into care. I am here now, who was hardly even there. The grand old man. Do I dare play that part? Except I feel that I am nowhere now. It gives me life enough, and little pain. On how I came to have so little time. For me, though life continues all the same. These late career poems by Clive James are among the very best of his works. Aerial voyager; fraught outsider? The duality in a poet’s nature takes the creative artist through many phases. Put shortly, then, there is probably no clear answer to some of the age-old questions you may have to ponder in coming days: what does it mean to be a poet? What is the nature of the creative process? Let me close by mentioning works by two contemporary American poets that bear upon these issues. In doing so, I am conscious that poems do not always assert precisely what they mean. More often than not the meaning is suggested. Beneath the superficial flow of common speech, the tedious accumulation of what we think we ought to feel, lies the truth of what we feel indeed. This is the poet’s realm, a place with a language of its own. His lords and ladies in a ring. And armed men at his command. The next lines come from a long poem by Delmore Schwartz called ‘Seurat’s Sunday Afternoon Along the Seine’. In this piece the poet dwells upon a famous painting by the French impressionist Seurat, a scene depicting married couples in 19th century dress strolling through the trees by the river, the bearded men in dark frock coats and formal attire, the women with their wide-brimmed hats and parasols, the children in their pinafores nearby. It becomes apparent as the poem proceeds that the scene is being viewed by a poet who is very conscious of the duality in his nature. The poem ends like this. The kingdom of heaven on earth on a Sunday summer day. ‘Flaubert was right: Ils sont dans le vrai! In these remarks I haven’t set out to say anything of particular note. I am here simply to wish you well for the festival in coming days and perhaps to leave you with a few lines of poetry that you might not have heard before. So let me now launch the Festival. Nicholas Hasluck’s latest novel Rooms in the City (Australian Scholarly Publishing http://www.scholarly.info/book/395/) concerns an Australian-born poet Robert Kaub who is recruited to an espionage unit in Athens during the Gallipoli campaign. 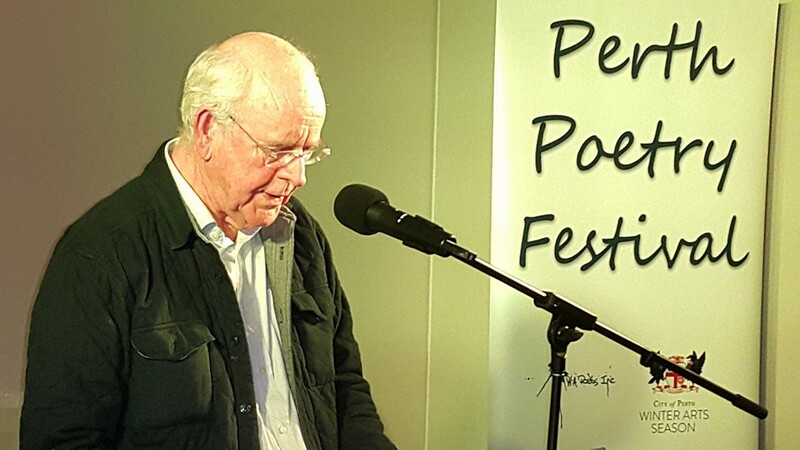 This entry was posted in Issue 15, The Perth Poetry Festival, Nicholas Hasluck and tagged Australian poetry, Calabash Literary Festival, Charles Baudelaire, Clive James, Delmore Schwartz, Elizabeth Alexander, Howard Nemerov, John Haines, poetry, Yaddo by Mark Roberts. Bookmark the permalink.